Almost a year after first surveying federal forest management from a public health perspective, a House Energy and Commerce panel is poised to take another look tomorrow, with a hearing titled "Air quality impacts of wildfires: mitigation and management strategies." The Environment Subcommittee's overview will explore options for managing and reducing the air pollution resulting from wildfires, according to a staff summary released yesterday. Witnesses will include state forestry and environmental officials, an Oregon lawmaker who runs a logging and wildland firefighting company, and the head of a national conservation organization. While state and federal regulators have had considerable success in reducing harmful industrial and vehicle emissions, the monster blazes increasingly common in the West have emerged as a major threat to air quality. A 2013 analysis by the research organization, Climate Central, found that wildfires can lead to air pollution levels "as bad or worse" than those found in the notoriously polluted city of Beijing. Severe wildfires, which produce large amounts of particulate matter, can result in communities "experiencing continuous unhealthy air quality conditions for weeks at a time," the staff memo said. 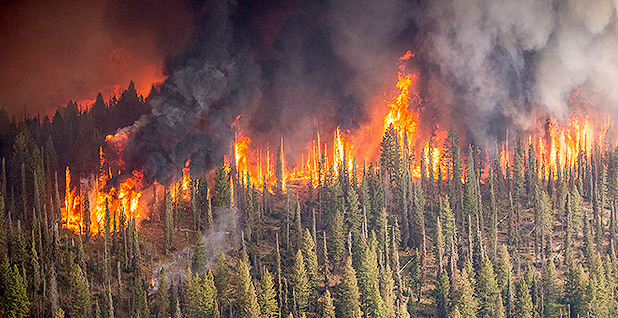 Like the subcommittee's initial foray into the subject last October, the hearing could feature GOP calls for more aggressive steps to reduce fuel for forest fires (E&E Daily, Oct. 5, 2017). The memo, for example, references a recently released Agriculture Department "strategy document" that calls for expanded use of prescribed burns that have traditionally been mostly used in the South; the document also urges more timber sales from federal lands (Greenwire, Aug. 27). Subcommittee Democrats could again urge consideration of the impact of rising temperatures and reduced rainfall in some parts of the West that are associated with climate change. Schedule: The hearing is Thursday, Sept. 13, at 1 p.m. in 2123 Rayburn. Witnesses: Mary Anderson, mobile and area source program manager, Idaho Department of Environmental Quality; Oregon state Sen. Herman Baertschiger (R); Tom Boggus, state forester, director of Texas A&M Forest Service; Sonya Germann, state forester, Montana Department of Natural Resources and Conservation; and Collin O'Mara, president, National Wildlife Federation.